The above location seems to be the building to the west of the cheese factory on the 1954 plat map but the shape of the foundation (long and narrow) and the presence of a cement platform at the front opening strongly suggests a cheese factory. 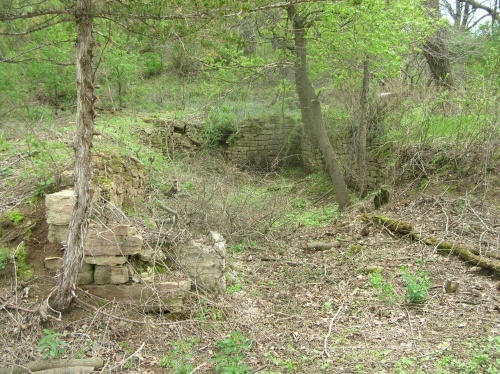 We believe that this was the original site of the factory probably when it was called Tyvand Cheese Factory for the landowner at that time. 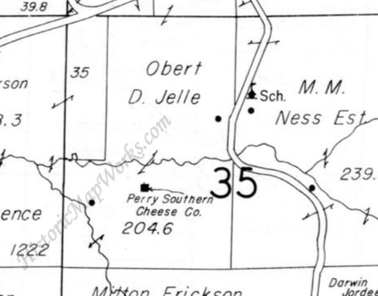 By 1909 it was known as South Perry. This building was shown on plat maps starting from 1890. It is difficult to tell from the subsequent plat maps just when the factory was moved to the eastern location but only the 1954 map shows two building. This location is closer to the map above. The land had obviously been disturbed. There was a distinct rectangular depression in the hillside and with scattered stones. Just to the west was a deep gully which drained into the creek below. This was probably the second site. Notes: Razed. Biennial report of the Dairy and Food Commissioner of WI: South Perry, Mt. Horeb RD 5 1909, Mt. Horeb PO 1913, Mt. Horeb RD 6 1922?. Perry PO 1896, Elvers 1898, Forward 1903, Blanchardville 1916, 1922, 1930.